The sun was out, I was out on my way to Mustang Maniac yesterday. I had an idea what was going to be done today but wasn’t to sure. The glass in the doors needed to be fitted and can be a real tricky to line up. It was time to open the box of bits and bolts to try and work out where some of these bits came from. I have learnt one thing with this car, although the nuts and bolts holds things in place they may not be the correct fixings. Again that turned out to be true with the window regulators. There were bolts holding it into the door that shouldn’t be there, adjusters that should be there weren’t there and it was all very confusing. The plan was to fit sound proofing to the driver’s door, and prep the glass itself. We had to work out a plan of action, we decided the painting of the window, Dynamat then the regulators. The main door glass is mounted on a metal frame and that had gone a little rusty on the surface. I degreased it, cleaned it, sprayed some rust proof on it then sprayed it silver. While each part was drying I worked on the door Dynamat and came back to the spraying. 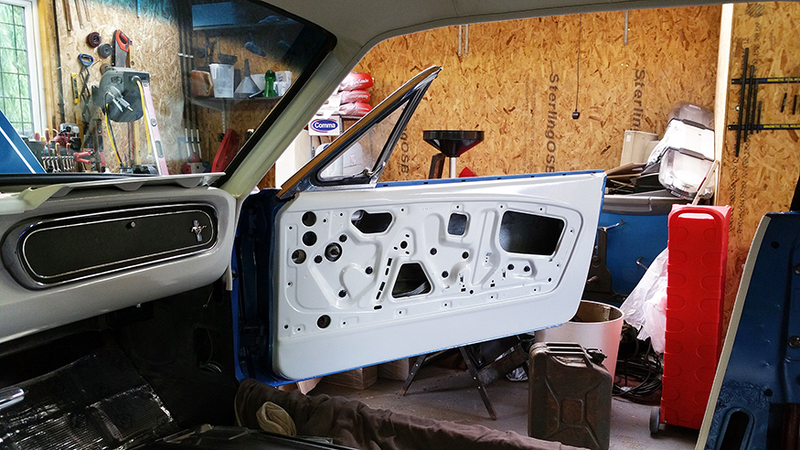 The insides of the doors are coated from the factory with a thick sound proofing. On the new door it would be just the skin. To stop the resonance and the road noise a sticky matting is stuck to the metal. Pretty much like the silver matting that is on the floor of my car that I covered previously, click here. The mat was cut to the length required and the angle needed to fit under the side rail. With the sound proofing done it was back to the main glass for more spraying. It takes a quarter of the time to dry in the sun. Next I started to fit the front quarter windows which was where I ran into the first issue. The quarter is slid down into the top of the door where the top adjuster is fitted as soon as you can see the hole on the frame. Once that is in place its a case of tilting the glass towards the rear of the car to get it into the position you need it. The issue was that the bolt at the bottom was supposed to be the second adjuster, it was unclear which side of the frame the adjuster would be fitted. To be sure Adam removed a door card from an old car in his “grave yard” to check. Adam was right, it was on the inside of the frame and pulled tight by a bolt. A little moving of the window around enabled me to fit the adjuster at the bottom in situ as it were. Two more bolts are then screwed to the outside part of the adjuster to hold it all in place as we had seen on the old untouched car. The second issue was that these two retaining bolts were missing, and they often are when removed. Adam had to get me a pack as I had nothing like it in my odds and ends fixings box. So that was the passenger door and it was to be repeated on the driver’s side. Now I knew what I had to do, it took a quarter of the time. Next up was the window regulators, this is pretty uninteresting to look at as it’s all inside the door. There are four bolts that hold the regulator and a trailing section for the scissor action that hold the glass. the secret to this part is how you fold the metal up and slot it through the seemingly tiny opening in the door. Once it’s inside you have to open it out then bolt it into place. Sounds easy, but when you have new paint work it took me a lot longer than I thought it would. Repeated on the driver’s side it was little quicker but still a slow process. All you can really see is the bolts in place so not terribly exciting for a days work! But, I did try to take a picture inside of the door with the mechanisms all in place. The final part is a vertical guide that slide into place at the back of the door. This is a support for the glass at the back. The front is supported by the front quarter window glass frame. You have got to hand it to the designers, this was a cheap car at the time and everything was modular which just bolted in place, so simple that it all just worked. Fifty years later the mechanism still works fine with a bit of new grease. Not many new cars will be able to say that in fifty years time! The plus side to all of this is that the glass that had been sprayed had dried nicely and should be cured fully when I come to fit it in place next week. A short post this week with not too much to look at as it was all hidden unfortunatly. But at least you can see a little bit of the door coming together now. This entry was posted in Photo's and tagged Dynamat, glass, Mustang, Mustang Manaic, One man and his Mustang, window regulator. Bookmark the permalink. Another great post! And I totally agree with craftsmanship. I love my new Mustang, but how I would love to open the hood and actually see a spark plug. Well done, friend! This is certainly an interesting piece of information! I’m just now finding out that you are also a VW man. Son Jon should be getting his new 2016 GTI in August. He became giddy when I told him that you own a Golf. What camera do you use? The pictures are very clear. Wouldn’t be fabulous that your descendant in 2065 will run a one hundred years old vintage car…Huh! Yes, so many small details! I know that all too well from my own Land Rover, that looks completed to the untrained eye but has a myriad of minor things to finish off. I feel a lot better now to know I’m not the only one who thinks that. Little by little. Seems so close, but still so many details.